The craft beer craze has taken LA by storm! Thanks to the passion and dedication of brewers and suds lovers with a mission, our city is awash in well-tended microbreweries, art-bedecked beer palaces, and industrial-cool taprooms. From great lagers to awesome ales, sumptuous stouts, and hoppy IPAs, you’ll find it all in DTLA – the hottest craft beer destination around! In a city known more for its glitz than its grit, Angel City Brewery is proud to rough things up a bit and work beneath the shiny surface. Their home in the Los Angeles Arts District is both brewery and canvas, the center of a revival for the city’s artists, musicians, hustlers, and craftspeople. 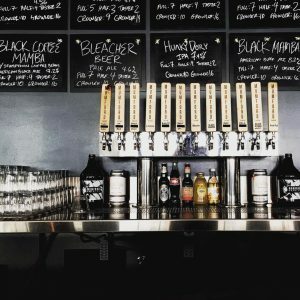 The establishment presents an ever-rotating selection of Angel City beer on tap, which includes a number of beers exclusively available at the Brewery. In addition to pints and flights, they offer brewery tours, events, and a small on-site retail store. Outside food is always welcome, and there are a number of great locations in the neighborhood that offer take out. In addition to the neighborhood cuisine, Angel City’s parking lot has become a hot spot for food trucks, with one parked outside nearly every night. Arts District Brewing Company opened December 2015 in Downtown LA’s historic Arts District.This sprawling establishment offers a variety of rooms for revelry, including Main Bar, Game Room with arcade and photo booth, Outdoor Bar and Patio, The Pub, The Study, and Chalkboard Area. Choose from their curated craft beer list, which is updated on a regular basis. The hearty food menu offers a beer-appropriate selection of wings, burgers, fires, salads, fried calamari, fish tacos, and nachos. Arts District Brewing Co. reserves tables Mon-Thurs. All weekend parties walk in and grab any space they’d like, first come, first served. Brewery tours can be specially arranged by appointment. In 2006, he was a math and physics teacher who started experimenting with hops, malt and yeast back home in his kitchen in Copenhagen. Today Mikkel Borg Bjergsø exports his micro brewed beer to 40 different countries and is internationally acclaimed as one of the most innovative and cutting edge brewers in the world. Mikkeller DTLA is an industrial-cool bar, offering rare tap and bottled beers alongside upscale pub grub including Charcuterie & Cheese, House Smoked Sausages, Burgers, Veggies, and Brunch Specials, such as Croque Madame and Wild Mushroom Omelette. 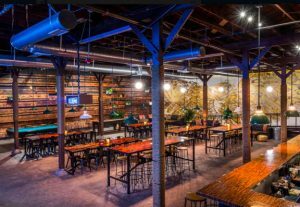 From their original space in Highland Park as a production-only facility, Highland Park Brewery has expanded into Chinatown, housing their first tasting room and second Brewery. HPB, as the brewery is affectionately known, was founded with the goal of making excellent beer in LA, focusing on fresh hoppy beers, lagers, and mixed culture fermentation, accompanied by unique processes, wacky microbes, and local ingredients. HPB offers a robust, beer-friendly food menu including Queso and Chips, Fried Cheese Curds, and a Sausage Plate with Chorizo, Salsa Verde and Focaccia. The Chinatown tasting room is kid friendly and dogs are welcome on the patio (no pups inside). Guests are also asked to not bring in any food not prepared in their kitchen. Attention bicyclists of LA! 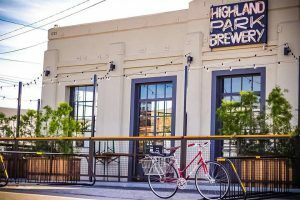 Highland Park Brewery recently installed two bike racks in front of their taproom, so bike riding customers can feel safe about locking up their bikes while they imbibe. In the mid-1800s, the boomtowns of California were points of convergence for those lured by potential riches and discovery. Today, Los Angeles maintains a similar allure for those who move in every year to pursue their dreams. 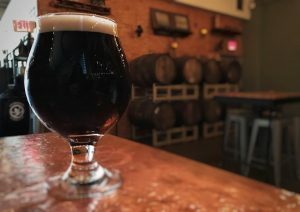 Boomtown Brewery aspires to speak to that audience and showcase their commitment to the arts and the Arts District by serving as a venue and showcase for artists and galleries. Local artists design many of Boomtown’s labels, as well as furnishings, fixtures, and structures. The taproom is a community space where people gather to enjoy beer, games, express themselves creatively and engage with like-minded people. 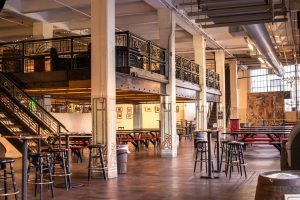 The brewery also hosts a variety of events, from DJs to gallery showings, benefits, block parties, bicycle rides, and more. An independent craft brewery and tap room along the L.A. River, Frogtown Brewery is owned by long time friends and home brewers Adam and Mike, who had the crazy dream to one day open their own brewery. After many years of hard work and planning, they finally made Frogtown Brewery a reality. Adam is passionate about IPAs – Mike loves stouts, and they both enjoy making and drinking Belgian style beers. They currently have eight different styles of beer on draft, with seasonal and experimental beers constantly in rotation. Their goal is to make Frogtown Brewery a place that the local community can be proud to call their own. So go ahead, have a seat at the custom made copper top bar and treat yourself to a pint. Cheers! Ready your body and mind for an epicurean odyssey at The Dankness Dojo, the DTLA pilot brewery, restaurant, and café from San Diego-based brewery & roaster Modern Times. 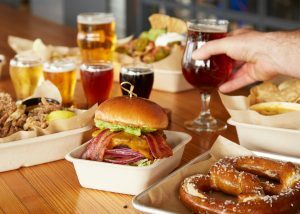 In addition to hosting Modern Times’ R&D brewing facility, The Dankness Dojo features a full menu of boundary-pushing plant-based cuisine; over 30 taps of delicious beer, plus guest beers & wines; merch, coffee, and beer to-go; and a cafe offering the Full-Spectrum Modern Times Coffee Experience. 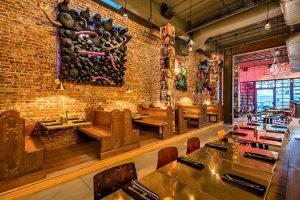 Modern Times has unleashed the full power of their design team on this historic space, resulting in wall-to-wall art installations. 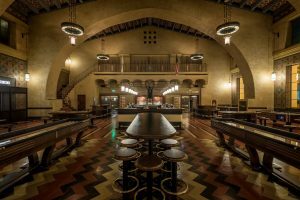 Situated in historic Union Station, this opulent beer palace and brewery has a regal menu to match, including fresh oysters, clams, scallops, mussels, shrimp, ceviche, along with steak frites, their signature burger, and house smoked pork ribs. Beers are arranged by clever categories including $5 Beers, Belgian-esque, Hoppier, On the Dark Side, Collaborations, and Cider. They don’t take reservations, but you can book space for a food and beverage minimum based on guest count. Please email [email protected] for more information.